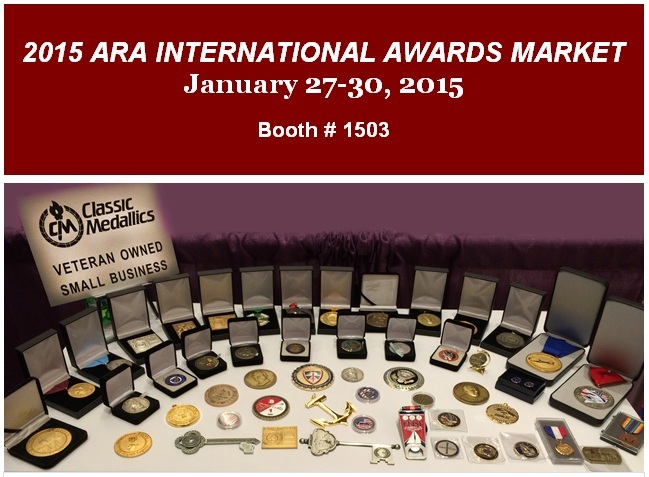 Please visit Classic Medallics, Inc. Booth #1503 during the ARA International Awards Market in Las Vegas, Nevada at Rio All-Suite Hotel and Casino. On display will be several categories of products, including medallions, medals, lapel pins, key chains, trophies, plaque plates, boxes, plaque mounts and plaque trims. Also we will be displaying several custom designed products. In addition to our stock merchandise and custom merchandise we will have several closeout items to offer at rock-bottom pricing. Most of the closeout items will be offered at half the net selling price. As always, we will have new merchandise on display. There will be special pricing on all merchandise. Don't miss the opportunity for terrific savings. See You in Las Vegas January 27-30, 2015!